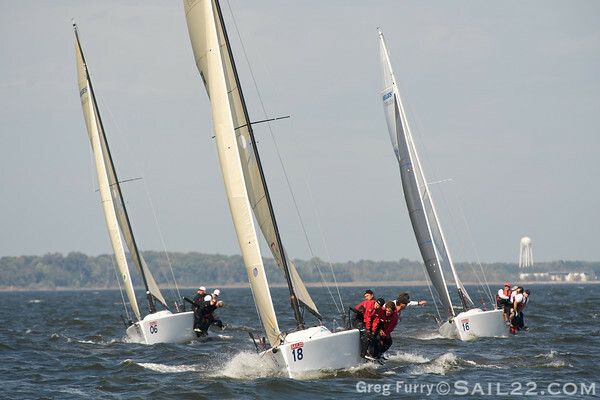 It was a beautiful day for day one of the Sail22 Melges 24 Worlds Tuning Regatta in Annapolis. Teams were able to get in four races with thirteen starts in total in a nice southerly sea breeze of 12-15 knots with puffs up to 20 knots. Throughout the day 18 teams participated and were coached by Dave Ullman throughout the racing. Check out today's photo gallery here. This evening was a great local weather talk from North Sail's Allan Terhune which was well received by the teams. The Sail22 Melges 24 Worlds Tuning Regatta is very grateful to our wonderful sponsors: Henri Lloyd, Annapolis Sailing School, Velocitek, West System Epoxy, Kaenon Polarized, Rite in the Rain, Heineken,Atlantic Rigging, Sebago, North Sails, Quantum Sails, Ullman Sails, Astral Buoyancy, McLube, WRI Weatherand Sail22gear.com.